I love Instagram. Being a creative, I’m so visual! So naturally, this platform allows me to express and share my creativity and thoughts with a wide audience. Both from a personal and professional level. HAVE YOU EVER FOUND YOURSELF SAYING “I NEED AN EXTRA HAND OR TWO”? Maybe you’re at the point where you just know if you had some extra help, you could keep moving your biz in an upward direction. If only you had a handful of amazing creatives you could pull out of your pocket when you needed them — you know you would feel more confident! I’m totally with you — because that’s where I was too. I started to think to myself, “How can I leverage Instagram to find the right people and put them in the right seats?” There has to be an easy way to find, organize and keep track of skilled creatives to connect with — the people I know will help elevate my business, and who I can collaborate with for other client projects. I started to type in keywords to the Instagram search bar with words like Creative, Copywriters, Strategist, Social Media, Assistant, Virtual Assistant, Photographer, Designer, etc. And I started to find the people I not only wanted to work with, but people I wanted to get to know personally. Make sure to include your “title” in your bio on Instagram, because it’s how your future clients will find and connect with you! So, I started to use Instagram to organize creatives by creating Collections with category names. Now, when I save out these individuals into my Instagram collections, I generally save a photo they have posted of themselves. So I will search through their Instagram feed and find their picture (an introduction post) to use as part of the collection. I do this because I like to connect with people, rather than saving a product photo (so make sure you frequently SHOW images of yourself in your feed!). Be human — people connect with people! Ponder this for a moment: I want to specifically draw your attention to the last bullet in the list above — the collection of “People to Engage with.” I consider this group of people my “leads” — people I want to nurture. These people have engaged with me about branding/website design and are generally interested in what I post about. So I like to have a special collection folder specially for them. It reminds me to follow up and engage with on a regular basis. Plus, if you have lots of followers, it makes it helpful to save out your dreamy clients. Remember that even if they aren’t fully ready to commit right now, you want to be top of mind when they need you — which means you want to engage! Don’t engage though if you don’t care…there is no point, and they know if you’re just pitching a sale. ANOTHER TIP FOR USING INSTAGRAM COLLECTIONS — SAVE YOUR INTERESTS OR IMAGES YOU WANT TO RE-POST. YOU CAN USE THE APP “REPOST” IF YOU HAVEN’T TRIED IT ALREADY. I’ve created collection categories like: Courses, Stock Photos, Quotes, Poems, Workouts, Food, Books to Read and more. Obviously you would tailor this to your own interests! But that just gives you a little idea! How have you utilized Instagram Collections? What categories do you have tucked away that would helpful to other businesses? Comment below. 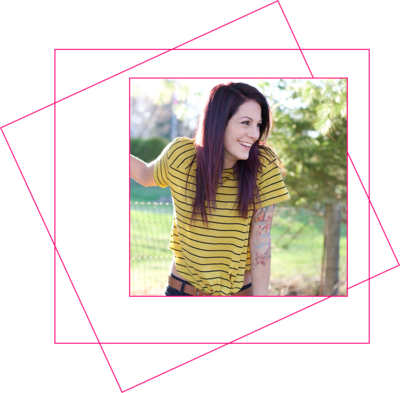 Ashley Gadd is an award-winning graphic designer, educator, and digital marketing strategist who turns squirrely ideas into captivating brands and websites that convert. Blending her education in design with her background in nonprofit marketing, Ashley offers customer-centric brand experiences that connect the visual and strategic dots, giving her clients the tools to build a sustainable and profitable business they’re proud of. Anything is possible. Explore more.